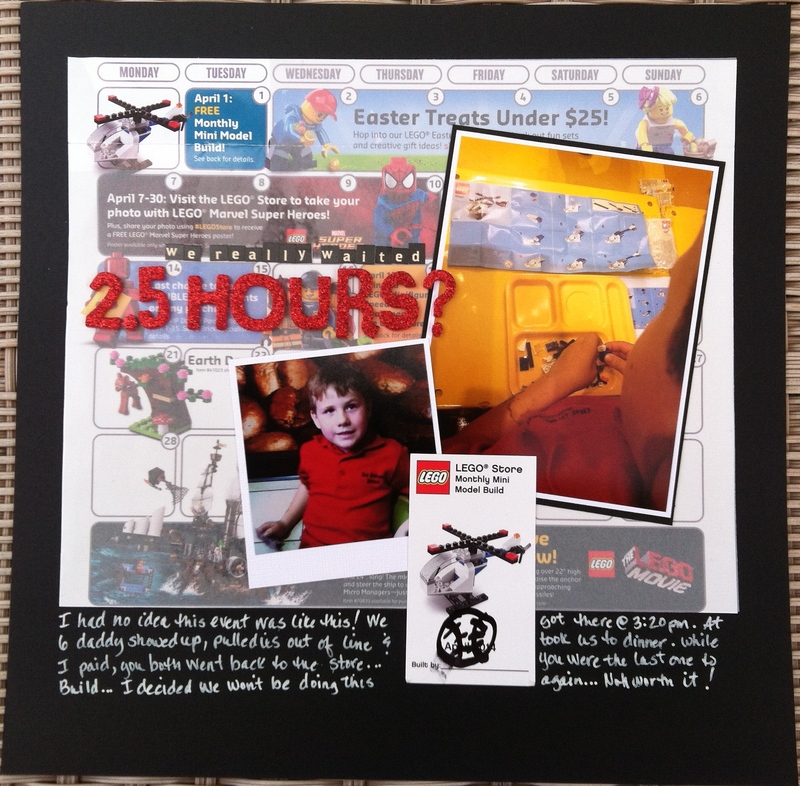 Home | Crafting | LOAD514 – Day Eighteen, we really waited 2.5 hours? LOAD514 – Day Eighteen, we really waited 2.5 hours? Today we were prompted to talk about our dentist. Now, if you remember that on Day 14 I talked about Sean’s first loose tooth, and his first tooth to leave his mouth. I just wasn’t feeling this prompt. I could talk about the fact that I’ve had the same dentist since I was 20, because the old dentist hit me. I could talk about my first dentist who thought braces would be purely cosmetic.. Nope, no dentist for me. A recent thing that Sean and I did that was particularly painful was when we went to the Lego store to do the free monthly build in April. And what a great day to have this build… April Fools Day. Boy did I feel like a fool too. Sean and I went right after school, got in line and waited. And waited. And waited. Then at 5pm the build started. We got there at 3:20 pm. We had been waiting for an hour and a half at this point. The line started moving… ever so slowly. And by the time that John got there at 6 to meet us for dinner, we were no where near the store. He pulled us out of line. He said his time was worth more than this. Oh my. He and Sean bought a Lego and we went to CPK for dinner. We had a nice dinner. We had a great time… Then, right before 7, Sean and John went back to the Lego Store while I paid the bill. Wouldn’t you know it. They got to make the free Lego!?! It was crazy. He got a free Lego, he got a new paid for Lego that he wanted. Sean won. That was the important thing. I guess. Here I used the calendar of events from the Lego Store. I thought it was too bright, so I used a piece of vellum to cover all but the corner where the actual event was… I thought it helped keep the busyness at a minimum. How do you use ephemera in your LOs?